For the Scent and Smell Competition some twenty different bottles and decanters of every imaginative shape and size will be required, and these must be filled with various liquids with a definite odour of their own - tea, coffee, liquorice-water, port, sherry, ale, peppermint, aniseed-water, camphor, and lemon-juice, for instance - each liquid being put into a most unlikely bottle - weak tea and ale into a couple of decanters, and port and lemon-juice into small medicine bottles. The bottles must each bear a distinguishing number, and each competitor must be provided with a card numbered to correspond, and furnished with a pencil. The competitors sniff at the contents of each bottle, and then note down what they believe its contents to be, and the one who makes the largest number of correct guesses wins the game, for which the prize should certainly take the shape of a bottle of scent, a sweet-scented sachet, or a dried lavender cone. For the Domestic Shopping Competition the hostess must previously prepare several large boxes or baskets full of odds and ends of every description - silks, satins, ribbons, laces, neck frilling, coloured wools and silks, besides safety-pins, knitting needles, and any other small odds and ends of haberdashery. From each basket a pattern sheet must be prepared, with scraps of satin, coloured wool, darning cotton, lace, etc. - not less than half a dozen items - pinned down it in a row. Each box or basket must bear a number, which is repeated in the envelope containing the matching sheet. The competitors are directed to sort themselves into pairs, a man and girl in each, and to begin the game the men range themselves behind the baskets placed across one end of the room, whilst the girls, each one armed with a numbered envelope, stand in a row at the other. As the bell rings, the men dash down the room to receive the envelope from their partners, and each rushes back again to his own basket, and, having torn open the envelope and examined the patterns, proceeds to hunt madly amongst endless cuttings for the special pieces from which his patterns were cut. The competitors, as a rule, work themselves into a state of frenzy over this herculean task, to the unbounded delight of the feminine onlookers, and many of them will return bearing a most hopeless collection of wrong shades of colour and wrong patterns of lace, to be reprimanded sharply by their indignant partners, while the couple who can show the best matched sheet wins the prize. For a Silhouette Portrait Cutting Competition it is necessary to provide as many pairs of scissors and sheets of black paper as there are to be competitors, and suitable paper, costing a penny or three-halfpence a sheet, can be obtained at any big store. 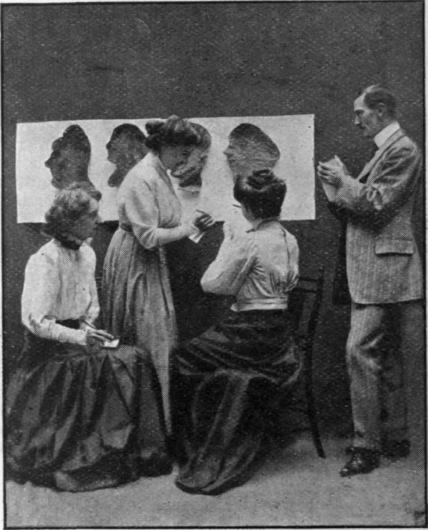 To begin the game, the guests, having been all provided with scissors and black paper, are sorted into couples - two girls can quite well pair off together if there are more girls than men present. When the bell rings, each scissor artist, swiftly taking in her neighbour's most striking features, proceeds to cut out his or her silhouette, emphasising the likeness as clearly as may be. The hostess meanwhile will have pinned up a sheet across one end of the room, and when the five or ten minutes' time allowance has expired, the bell rings for all work to cease, and the designs are collected and fastened up against the sheet. Voting papers are now passed round, and the portrait which gets the most votes wins the prize. Before the guests arrive, the hostess should place a number of piles of finery of every description in a dressing-room, arranging a special set for each girl present, and placing a distinguishing number against it, before noting down the items of which it consists for future reference. To begin the competition, the guests are sorted into couples, each man being given a pencil and reporter's notebook bearing a number on the first page, while each girl receives a similar number painted on cardboard and attached to a ribbon-string by which to hang it round her neck. The "reporters" are now bidden to sit in a row opposite a line of empty chairs while the girls, who are to represent ladies of fashion, retire to dress up, a strict time limit of not more than ten minutes being enforced. Each girl now dons the pile of finery which bears her number - a large matinee hat with several feathers and a rose, a white lace veil, long white kid gloves to reach above the elbow, an ostrich feather boa, and a lace fan, perhaps. 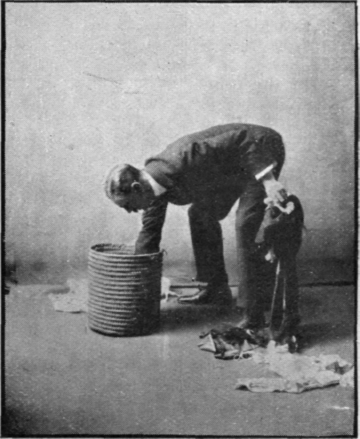 The piles should each be made as different as possible, and the more ludicrous the contents the greater the hilarity with which the wearers are greeted on their return, when, having paraded the room to show themselves off after the manner of the mannequins at a fashionable dressmaker's, they occupy the vacant chairs. When they are seated, the reporters hastily proceed to write an account of their costumes, the more detailed the better, while, in the awarding by the hostess of marks for prizes, half the marks will be given for correctness of description and half for a distinguished journalistic style. Voting papers are passed round, and the reports are read out amidst much merriment, and the reporter whose account secures most votes is awarded a prize, which might well take the form of a small doll pincushion dressed in the height of fashion. In this popular competition a cord is drawn tightly across the room, a foot or two below the ceiling. From this cord hang as many small presents as there are guests. Mock tangerine oranges or potatoes containing cracker caps are excellent for the purpose, as are new and entertaining penny toys, crackers, wee baskets of chocolates, small bunches of hothouse grapes, a few of the little artificial nosegays which are nowadays so popular, wee bundles of cigarettes tied together with a tiny bow. Any variety of amusing or useful trifles may be included, each suspended by narrow ribbon from the cord so as to hang within about four, five, or six feet from the ground, and form a bobbing, tantalising row for the competitors. To begin the game, the players are marshalled behind a wide white tape, tied between two chairs, placed several yards apart at the opposite end of the room. The players are now blindfolded one at a time, and turned round three times. They are then handed a pair of blunt-ended scissors, with directions to go forward and cut down a gift. No feeling is allowed, and the left hand must be held behind the back. The master of the ceremonies is, as a rule, very helpful, and stands with outstretched hands, prepared to catch the chosen treasure as the string is cut and before it can fall to the ground. A matchbox that is always ready to hand is a great convenience in any room, and as those that have no fixed place of abode are apt to stray into other apartments, and frequently fail to put in an appearance in moments of direst need, the use of hanging matchbox holders, securely fastened to the wall, is to be advocated, and as they should occupy prominent positions, the subject of the suitable decoration of these is well worthy of consideration. Many appropriate devices can be readily carried out at home, by those artistically inclined, from wooden safety matches ingeniously grouped and mounted upon plain foundations. The materials required consist of boxes of safety matches, metal receptacles for the same (these are supplied with packets of a dozen matchboxes, or can be procured separately at many stationers), gum, cardboard, scraps of white and coloured paper, a penknife, and a wooden board on which to cut the matches. Oil or water-colour paints are used for finishing touches, and for lettering. On no account should any but safety matches be used in making up the designs. 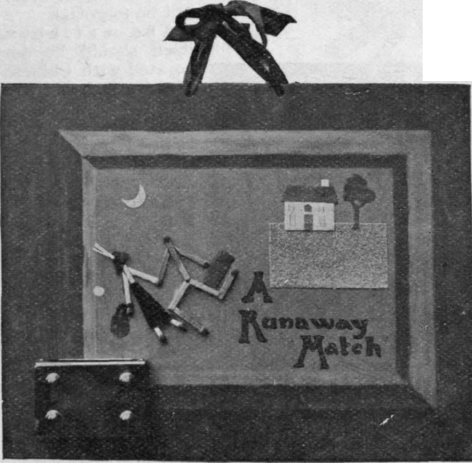 The design illustrated in "A Runaway Match" has for foundation a brown cardboard photographic mount, on which a little gentleman, formed entirely of wooden matches, is seen eloping by moonlight with a fascinating wax vesta clad in a black velvet hobble skirt and a picture hat of red cloth with fashion-able quills secured by a green ornament. In one hand she carries a green bag, the other is clasped in that of her lover. The white house they have left stands in the background on a square of sandpaper; it has a red roof and green door and window blinds. All these accessories are cut out of paper and gummed in place. 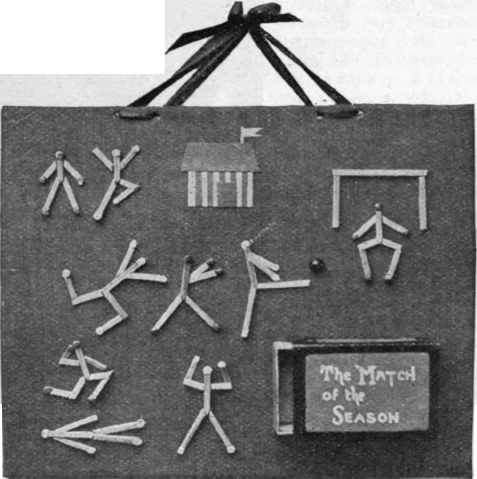 The words "A Runaway Match" are in red, outlined with black, and a brass matchbox holder is secured in one corner. Green ribbons are passed through holes punched through the top of the mount.